Have you ever watched a whiteboard video? If you have, you’ve probably felt enchanted by it. They’re one of the most popular explainer video styles out there and have become a highly useful tool to connect with your target audience using an emotional approach. Moreover, this type of video gives you the chance to deliver your business ideas in just a couple of seconds, and do it in an engaging, attractive and also educative way. But the question could be: when should you go for this style? And what’s even more important: how can you get to a highly effective video? Read this article and get these answers, plus some additional information to make your explainer video rock the web! This is a good example of how a whiteboard video should be. As you can see, it has a special touch that makes it unique and highly attractive. But what is so special about it? Originally, this type of video was “hand-crafted”. And we’re not exaggerating! We mean it! In the past, whiteboard animation presentations were made by an artist, who drew on a whiteboard while being recorded by a camera. But as the years went by, this technique was optimized and empowered with 2D character animation and also some special effects to get to a high-end result. As you might know, video content per se has a huge engaging power, but whiteboard animation in particular has that special ability to set an emotional bond with your viewers. By leveraging the effectiveness of animated characters, you can educate your audience using a cool and alluring format. But there’s more: you also have the chance to pass out your business idea (this is, what your product is about, how it can help your customers and why you’re the best option in the market) in a fast, brief and straightforward way. Why is it that this style is so enchanting? Well, in whiteboard videos the story is created in front of the viewer’s eyes, and this is pretty captivating! Huge educational power and the amazing capacity to pass out any kind of concept. Amazing visuals and the storytelling technique behind it, which contribute to generate different emotions in the viewer. Lovely characters, that give the video that special human touch and make it even more enticing to watch. Tip: take a few minutes to delight yourself with these 5 fabulous whiteboard videos! When Should You Make A Whiteboard Animation Presentation? Now that you know the basic information about this style, let’s understand in which cases you should pick it out to complement your video marketing strategy. Ask yourself these questions and you’ll realize if whiteboard animation is the right fit for your specific case. As you can imagine, whiteboards have a huge educational power. Just remember when we used to be exposed to a board at school to learn something. Same thing happens in the marketing field, in which animated marketing videos have adopted this technique to convey the most complex concepts in a very direct and simple way. Although explainer videos, in general, must have a specific length, it also may happen that you need some extra time to explain your business idea. And guess what? Whiteboard videos are perfect to extend that limit! There is a reason behind this: when people see a whiteboard in front of their eyes, they know that a lesson is about to be explained…and that it could take some time. This means they see a whiteboard and they simply “get in the mood” to listen and to pay attention. The story is also created in front of their eyes and this helps a lot to trigger curiosity and expectation. Animated characters can give that extra personal touch to your video, so it’s great if you’re thinking about adding them. If you craft custom characters, you will set up a strong connection from your audience towards the characters on screen (they will look similar in terms of look, style, behaviours, and needs). This helps a lot to imbue them with trust and confidence towards your brand and product. No matter how you answer this question, whiteboard animation videos are a great choice and work very well for both types of companies. Let me explain this: first of all, they are a very versatile style that combines different “condiments” (appealing visuals, alluring characters, a dose of humor, the storytelling technique, and more). With this in mind, they work very well for B2B companies that need to deliver a complex or abstract concept in a persuasive way, but also for B2C companies that aim at reinforcing that emotional bond with their target audience. Now you have a clear idea if these videos can work for your case, right? So it’s time to give a quick review on some of the best practices in whiteboard animation. Tip: psst! Before moving on, remember that, besides implementing these tips, the script itself plays a key role in any video production process. So take a few minutes to read these recommendations in our free eBook “How to write a script for an explainer video”. The script is a critical element to make your video highly effective! Add the drawing hand: keep in mind that the hand is part of the essence of these videos. It wouldn’t be a whiteboard explainer video without it! What’s worse: you wouldn’t get the effectiveness and educational approach you need. Connect the drawings: this is especially important so as to make a smooth and seamless animation (and consequently, story). 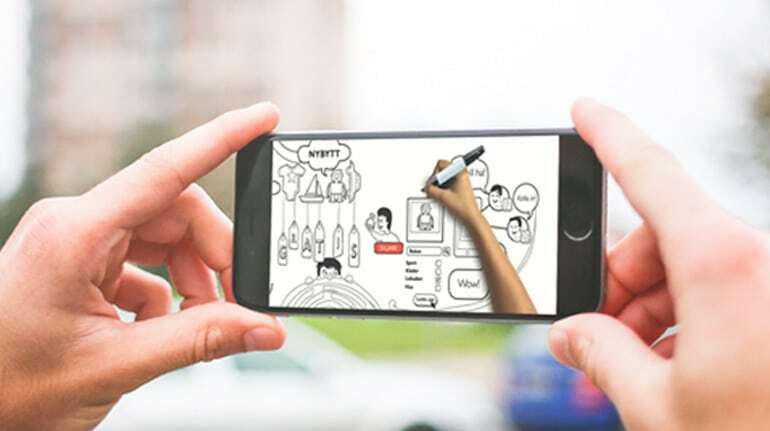 Connecting the drawings is a must to make your video engaging…but also coherent! Include emotional elements: by adding some extra references that have the ability to trigger different emotions (such as bringing back old memories through retro games or classic films) you can make your video even more persuasive and memorable. Make it educational: the educational approach is one of the main characteristics of this style. So don’t omit it! Stick to its essence by explaining “something” you need, to fully leverage the benefits of this style. Don’t forget about the white background: this is another typical feature of whiteboard videos. The background must be white, there’s no way out. Keep in mind that these videos are typically recognized by the white background, so don’t mess it up! Make it fully custom: again, customizing your video is the only way to get high engagement and interest from your audience. By making a template video you will only get poor engagement, scarce interest and no memorability at all. This will end up bringing terrible marketing results. No way! Give it the right length: keep in mind that people have very short attention spans, so you don’t have much time to deliver your key message. Try to stick to the 90 seconds we always recommend for explainer videos, but also remember that, if you need, this style lets you go a little bit longer. Tip: why not review the whole process of whiteboard animation? It will definitely help you for the time you develop your video! Take a few minutes to learn how to make a whiteboard video step by step. At Yum Yum we have wide experience in whiteboard animation presentations. We have developed thousands of videos for different companies from different niches. And our goal is, always, crafting custom videos that generate strong engagement rates in their target audience. We also focus on keeping an eye on the details and giving the best quality to each stage of the video production process. We’re convinced this is the only way to get to a highly effective video. So, in case you need help with yours, feel free to drop us a line!